SFLvault offers a flexible User-Group-Service permission system. User 1, being admin for Group 1, would be able to group-del-user -g 1 -u 2. User 1, not being in Group 2, would not be able to add Service 2 to Group 1. This is a cryptographic restriction, and there’s nothing anyone can do about it. You need access to the service’s info to add it to a group. Note that a user can add a service to a group he doesn’t have access to. He only needs to currently have access to the Service by some other group. Tired of copying passwords to the shell ? Then typing the next ssh command, with the right parameters, then copy / pasting the next password again ? SFLvault allows you to automatically connect to remote ssh:// servers, even in cascade, sending passwords all the way to the destination. and you’ll be shown a hierarchical view of the connections needed to reach [service_id]. It creates a chain of services of any types (that must be compatible). It will provide you as a result with either a port forward or an interactive shell. SFLvault will spawn a ssh process, wait for the “Password:” prompt, and send the password (received from the Vault, provided you have access to it). It will then send an ssh command, over the previous shell, wait for the “Password:” prompt again, and send the second password. SFLvault will drop you in an interactive shell once at the end of the chain. It handles the cases where you have shared-key authentication (when there’s no Password: prompted). It also supports the full terminal, with window resizing signals, etc. If we continue the ssh -> ssh example, SFLvault would simply make another hop (with another ssh command and another Password:), and then it would use the mysql plug-in to send the right mysql -u user -p command to the shell. It will wait for the MySQL prompt and then give you an interactive shell. This one is a bit different, since http requires a port forward, and not a shell. So when setting up the chain, it will be configured to provide an port forward instead of a shell (which it might provide additionally). 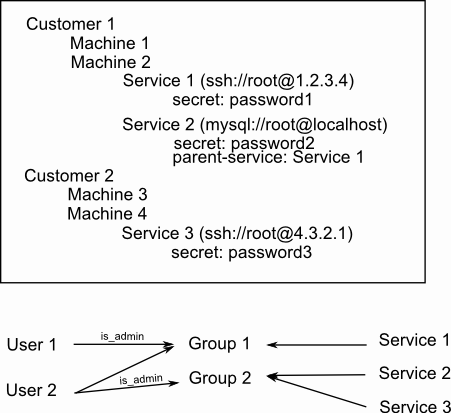 The first ssh will be spawned locally with parameters to establish a port-forward locally to a machine on the remote site. In this first step, it will be the second ssh‘s hostname. Then, a second ssh command will be sent through the shell, establishing another port-forward to the http service’s hostname, setting up all the intermediate port numberings to fit your needs. Going interactive here will print the http://host:port/ for the service you’re trying to reach, something like http://localhost:12345 and will also drop you in interactve shell.